After showing gradual improvement over the course of the first five races of the 2013 American LeMans Series schedule, Marc Goossens and Dominik Farnbacher have scored the long awaited first win for the new SRT Viper GTS-R racing program. The #91 Viper driven by Goossens and Farnbacher managed to limp the across the finish line under caution with their fuel levels running dangerously low with a pair of Chevrolet Corvette C6 ZR1 race cars close in tow – both also running very short on fuel. This was the Viper’s first win in endurance racing since New Years Eve of 2000. The #93 Viper driven by Kumo Wittmer and Jonathan Bomarito finished 6th in the class but had the race not ended under caution – the #93 Viper would have stood a very real chance of winning the race. After being the fastest car around Road America in qualifying, the #93 Viper was one of the fastest cars during the race, turning in the quickest lap time for the GT class. Towards the end of the race, the #93 team had positioned themselves to be able to make it to the end of the race without stopping for fuel while the #91 car – and several others including both Corvette teams – were facing another stop very late in the race. Should those teams have been forced to pit, the #93 Viper would have been locked in a battle for the win but a late race caution sealed the field and allowed the #91 Viper to stroll to the first ever win for the SRT Motorsports Viper. The 2013 SRT Viper GTS-R race program was introduced a couple races into the 2012 American LeMans Series and while the folks at the Chrysler Group were hoping that this modern Viper racing program would storm onto the scene like the original Dodge Viper GTS-R did back in 1998 – the teams spent most of last year at the back of the field. While one of the two SRT Viper GTS-R teams would occasionally climb into the top 5, the new Viper race cars were never really competitive with the cars that were winning the ALMS GT class. To say the least, it was a tough road back for the V10-powered supercar in the first season but brighter days were expected for the 2013 season as the Vipers would run a full schedule. Unfortunately, things didn’t start off quite as smoothly as the SRT Viper teams had hoped but over the past few races – including a stop at the 24 Hours of LeMans – the Viper drivers have shown that experience behind the wheel plays a big part in the level of success for ALMS drivers. In a class where many of the drivers have been competing in their race car for years, the core driving team for the Vipers consisting of Dominic Farnbacher, Kumo Wittmer, Marc Goossens and Tommy Kendall have really had just over a year at this point to learn the car. In fact, this weekend’s victory at Road America comes just 53 weeks after the new Viper GTS-R made its formal debut in 2012 at Mid Ohio. The first ever win for the SRT Viper GTS-R program comes just one event after the Viper teams finished 2nd and 3rd behind the Corvette driven by Tommy Milner and Oliver Gavin. 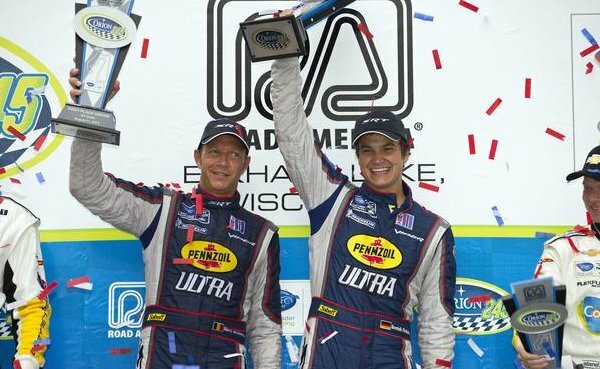 Due to the success in these two most recent events and a fair amount of consistent mid-field finishes for the #91 Viper – Goossens and Farnbacher find themselves in fourth place in 2013 ALMS GT class standings while Wittmer and Bomarito sit back in ninth place. Goossens and Farnbacher are just 17 points out of first place in the championship standings so with a great deal of momentum heading into the final four races of the 2013 ALMS season, the #91 Viper team stands a very real chance of making a run for the title. The next stop for the SRT Viper race program and all of the American LeMans Series teams comes at the end of this month when they take to the street track of the Grand Prix of Baltimore.